Bed bugs are a type of wingless insect found worldwide, that feed off the blood of humans and other mammals such as birds and bats. Bed bugs are not known to transmit diseases to humans. Anyone who comes in direct contact with bed bugs can carry them into their homes in clothes, second hand beds and bedding, furniture, or suitcases. 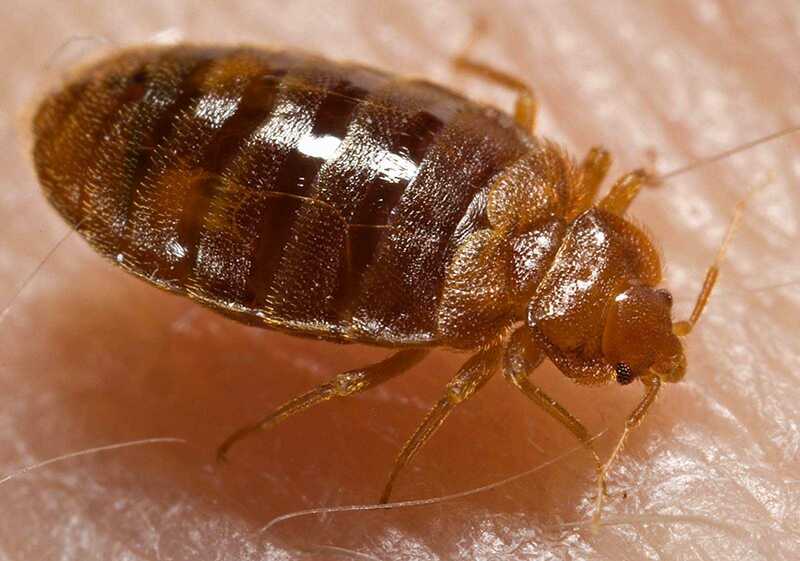 Infestations are not tied to unsanitary living conditions; even world-class hotels have reported bed bug problems. Bed bugs may be found in homes, motels, hostels, movie theaters, transportation depots, and rest rooms. They may be accidentally moved with clothes, suitcases, furniture, and other personal items. Bed bugs may also be transported in second-hand or rental furniture. Bed bugs do not fly or jump, but they move quickly over floors, walls, ceilings, and furniture. What are the symptoms of bed bugs? Red itchy welts are an indication of an infestation. Bed bug “bites” occur when the bed bug is actually drawing blood. Saliva that is injected during the bite can produce swellings on the skin that may itch and become irritated and infected when scratched. It may take as long as 14 days for a welt to appear from a bed bug “bite.” Common areas on the body that are affected involve the arms and shoulders. For the most part, bed bugs only feed in the dark. During the day they hide in dark cracks or crevices. What is the treatment for bed bugs? Resist the urge to scratch. Scratching may only intensify the itch and cause an infection. Apply an ice pack frequently to help relieve swelling. See your health care provider if you develop an infection. How should I check for bed bugs? Bed bugs are difficult to identify because of their small size (1/4 to 3/8 inch) and because they like to hide in dark cracks or crevices. Usually the first sign of a bed bug infestation is the appearance of small rusty spots on your mattresses and bed linens. These are bed bug droppings and feces. There may be an offensive sweet odor in rooms with heavy infestation. At first, bed bugs are likely to be found only on the tufts, seams and folds of mattresses and daybed covers; later they spread into crevices in bed frames, couches, chairs, and other furniture in the home. Once they multiply, they may be found in baseboards; window and door casings; pictures and picture moldings; loosened wallpaper; cracks in plaster and partitions. Preventing bed bugs can be difficult in any home or living space. Indirect measures can go a long way in controlling bed bugs: monitoring for signs of bedbugs in your home, vacuuming regularly, and checking your belongings. Prevent bed bugs from getting into homes by checking clothing, used furniture, and belongings before entering the home and monitor where you have visited. Continue to reduce clutter and unwanted items in your home and hire a professional exterminator to inspect your home if you suspect there are bedbugs. What can I do if my home is infested with bed bugs? Complete elimination of a bed bug infestation may be difficult without the services of a licensed exterminator. It may even take as many as three or more treatments to gain control of an infestation. Do-it-yourself measures used by homeowners and renters sometimes cause more problems than benefits. Reduce the amount of clutter to achieve a good treatment and eliminate hiding places. Inspect furniture in the home and any used or new furniture purchased. When returning from a trip, inspect your luggage and clothes for bed bugs. Clean luggage appropriately with a vacuum and normal washing and drying of clothing. Vacuuming and steam cleaning of infested mattresses and furniture is effective in killing bed bugs living in seams and buttons. Dispose vacuumed contents in a sealed plastic bag and straight to the outdoor trash can. Pull bed and bedding away from the walls to reduce the risk of bugs crawling from the wall to the bed. Cover mattresses and box springs with durable covers that zip. Wash bedding and garments in hot (120° F) water. Put clothing in a dryer for at least thirty minutes to kill bed bugs. Contact a licensed pest exterminator to treat your home in conjunction with the guidelines mentioned above. If you rent a home or apartment within Hamilton County (excluding cities of Cincinnati, Norwood, or Springdale) and you think you have bed bugs, please contact the Hamilton County Public Health at (513) 946-7800. Sanitarians will work with your landlord to eliminate the problem. Download a printable version of this fact sheet here (Spanish/Español).